Many teacherpreneurs start with Pinterest and want the magic to happen right away. I get it. You have good resources that you want to get into classrooms, and you are excited. Try to be patient, my enthusiastic friends. Pinterest takes time. 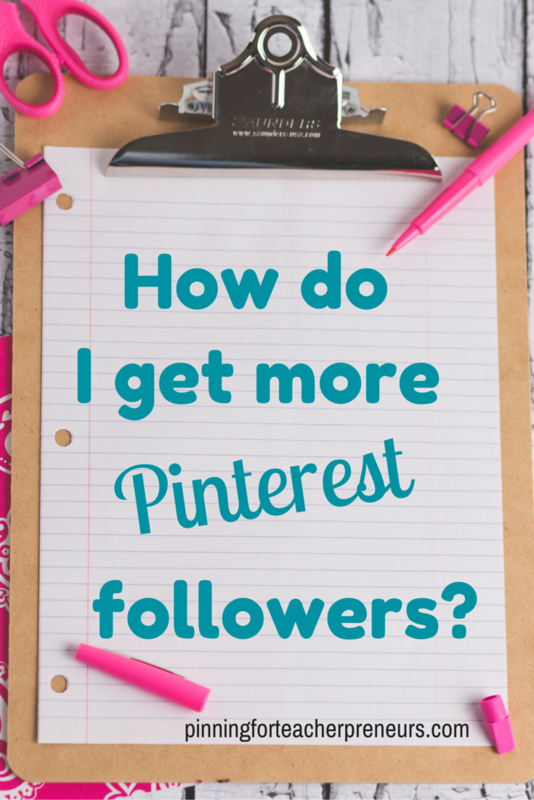 To reap the full benefits of Pinterest, you will need to grow your following. You want a good following, but let me warn you, all followers are not created equal. You also want the right following. 1. Pin good content. This is #1 for good reason. If your pin boards do not contain good pins, you will not get followers. I know it may seem like you are pinning for your eyes only. Down the road, when you have a larger following, you can re-pin the content from your own boards since you already know it’s good. 2. Pin content that your ideal customer wants to see. If you sell teacher resources, but all of your pins are cupcake recipes, you may be collecting the wrong followers. There is nothing wrong with having personal boards and pinning cupcake recipes, but just make sure that the majority of your focus is on your teacher boards. 3. Pin consistently. You want to pin often. Find a schedule that works for you. I’ve heard this helps your pins get seen with the Pinterest algorithms. But since I can’t control the Pinterest algorithms, I like to focus on what I can control. When someone happens upon one of my boards, I want them to see that not only are there good ideas there, but I add to it often, so you definitely want to follow it. 4. Re-pin content from others. This is great for making sure that you are pinning good content, but it also sends out good Pinterest karma. I don’t believe you should just pin so that people will pin for you in return. I prefer a more natural and organic approach. If you like it and it fits your audience, pin it. 5. Strategically follow your people. Who are your people? Teachers who you want to buy your resources. When I first started, I found 20 teachers to follow each day. You don’t want to do too many in a day because I’ve heard Pinterest will flag you as a spam account. Following your ideal followers is good because you can see what they are pinning, and pin more of it, and you also many will notice you, and if they like what they see, they will hopefully follow you back.